In this article, we will discuss the case of a boring stock that hardly will be of any investors fancy. But his stock has delivered close to 10x returns over the last 8 years and it has achieved this feat without any significant growth in sales. Mind you, the sales have grown at a CAGR 13.1% over the last 10 years while profits have grown at a CAGR of 16.76% over this period. The company we are talking about is – Honda Siel Power Products Ltd.
What we can learn from this report is that to earn multibagger returns, you don’t always have to grow your revenues > 20% p.a. A company with an average growth in earnings and decent return ratios can be a multibagger too if bought at cheap valuations. HSPPL saw it’s PE expand from 15 to 24 in the last decade despite an average sales growth. The Indian GDP has grown by ~6.5% p.a. over this period and inflation has averaged ~ 6% p.a. HSPPL has managed to grow at par with the nominal GDP growth rate and at the same time has improved its margins, thus generating wealth for shareholders. Raghav Behani Equity Research is an equity research firm (SEBI Registered) that provides long term equity advisory services to its clients under the following Plans. The readers are advised to consult their own adviser or brokers before taking a financial decision on the company discussed here in. To get a free report on a potential multibagger, you can submit your details here. Honda Siel Power Products is a subsidary of the Japanese company – Honda Motors. HSPPL was incorporated on 19th September, 1985. The company enjoys a leadership in the power products industry with a wide product range which is consumed in the domestic market and also exported. The company has its manufacturing facilities at Greater Noida. The Honda engines are used in power sprayers, air compressors, rail drilling machines, pump sets and concrete saw cutting machines to name a few applications. The Honda water pumps are used for irrigation in small land holdings (Upto ~ 5 Acres). The pumps come in three varieties – Kerosene, Diesel and Petrol. Honda enjoys a 40% market share in the water pumps industry. The Honda portable generators are used during power cuts. Honda enjoys market leadership in the organized portable generators segment with a huge 80% market share. Honda generators are also acclaimed as the quietest generators in the market. The company launched the rotary tillers in April, 2016 and expects significant revenues from the same going forward. The company claims to be getting good response for their tillers but what remains to be seen is if they can grow the tiller segment at 25%+ YoY and grab market share from existing players. North America is the major export destination for the company whose exports contribute roughly ~41% of the revenues as per FY17 figures. UAE is another important destination for the company. The power backup market in India is around ~ Rs 5,000 Crores. The global diesel genset market is expected to be worth $19 Billion by 2019. Inverter industry is highly fragmented and dominated by Luminous Power (28% market share), Microtek and Su-Kam. Despite having low growth rates over the last 10 years, Honda Siel Power Products turned out to be a multibagger for its investors largely due to PE expansion. The company has been able to convert the profits to cash. The figures in the above table show difference due to some adjustments of extra-ordinary items. The ROCE has fluctuated between ~ 11.5% and ~ 22% throughout the decade. The Return on Networth is however quite average with it peaking at ~15% at three different occasions. The company has room to borrow funds and boost the return on net worth (More on this later) but they choose to use only cash generated from business to fuel growth. The company has largely been able to maintain its turnover ratios throughout the decade. In 2009, the company had consolidated its operations in Noida by moving the Rudrapur operations to Noida. This move was done to optimize costs and improve margins. However, a general analysis of the margins show that the company was unable to meet its goal of cost optimization post shifting of operations. Raw material expenses form a major chunk of the company’s cost and are roughly ~50% of their net sales. The major raw materials are steel, aluminium and copper. The company has been able to pass on the price rises over a period of time to the end consumer which is a positive sign. 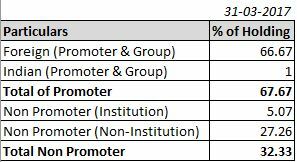 The major promoter shareholding is with the Honda group and 1% is with the USHA group (Shriram). Alchemy Capital and Lashith Sanghvi hold a chunk of this company in their portfolio. There are a lot of related part transactions in the books of the company majorly due to it being a subsidiary of Honda. The company pays royalty at 6% of net ex-factory sales price to Honda Motor Co Japan apart from export comission, sales of finished products, purchase of raw materials and finished goods. In FY16, the company had related party income of Rs 226.57 Crores, related party expenditure of Rs 173.69 Crores. The stock currently trades at a PE of 24.35 and a price-to-book ratio of 3.49. When compared to its historical valuations, the PE has fairly priced in the positive factors. The PE has been trading above 15 since mid 2012 and is quite high for a company that is growing at a 10% CAGR and doesn’t have many tailwinds for exponential growth going forward. The fluctuating margins and return ratios make it seem more like a commodity business and for the same reason a PE of 24 is fair. Now, interest rates are trending lower and in this scenario, we are definitely going to see higher PE ratios than previous years. Even the P-BV ratio looks fairly valued at current prices. The company was available at throwaway valuations till 2009 and even in 2013. However, it was majorly on back of poor margins and profitability in FY13. Should you invest? Can HSPPL give 1000% returns over the next 10 years again? The company has cash of ~ Rs 142 Crores in its books which brings the Cash to Market Cap ratio at 10.24% which seems very good however, the cash in the books of the company brings down the return on capital of the company as it can earn only 6.5% to 7% post tax on this idle cash. The company is not opening up on dividends and the dividend yield is less than 0.5%. The management should consider a buyback of shares as it will increase the return on networth that the company is currently making. The company has a low equity float. With Rs 10.17 Crores as the paid up capital and a face value of Rs 10 per share, the number of shares are ~ 1,01,43,071 of which close to ~ 27% is available with non-promoter non-institution shareholders. This means around 27.38 Lakh shares are available with retail shareholders. The potential returns going forward are not in sync with the portfolio we are building for our clients. However, patient long term investors with a horizon of > 5 Years can take a deeper look at this stock for their portfolio.